THE HESLOP HOUSE: DUTCH OVEN! 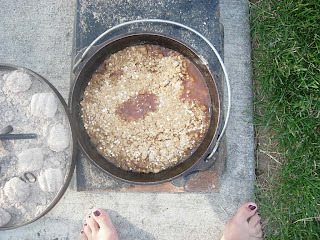 So we took it upon ourselves to do a little dutch oven tonight, and it was yummy! 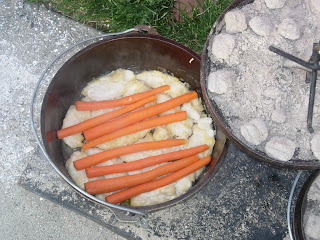 We tried a breaded chicken recipe and threw in some carrots, for color. It tasted pretty darn good. And of course we had to do a dessert!!! So we did an apple cobbler, I used my apple pie filling I canned last fall, it was delicious! All in all dinner was great. 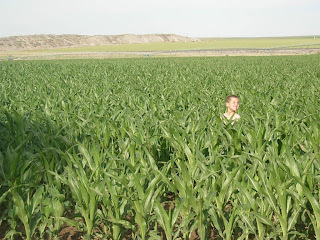 You know it's summer time around here when your kids play in the corn and ya can't see them any longer! We'll have to keep an extra tab on them this year, these fields go FOREVER!!! We wouldn't want them to end up on the other side! Presley had fun today going for some rides in Conners dump truck. 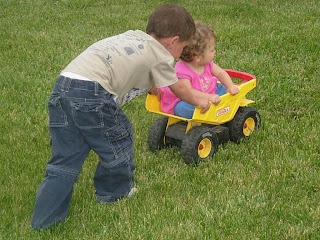 They went all the way around the yard, and then he took her in the garden so she could experience some rough terrain. All the kids had such a busy day, they were all tuckered out and ready for bed right on time! yeah for me. Glad summer is FINALLY here. 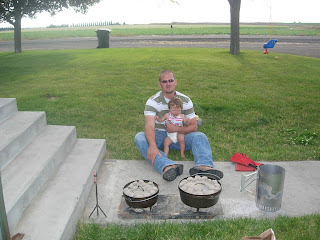 dutch oven huh....sounds good! one of my favorites. you will have to tell me how you made the pie filling, i might want to try that! the kids all look so cute at the lake and playing in the yard!! good times! What a fun layout for your blog! So cute! I love dutch oven. It totally reminds me of summer fam get togethers. The best! Hope your summer is going well. We need to drive down and see you guys! Ok... so after I pop this little sucker out of the oven. Then maybe I will feel more mobile and get off the couch. I can't believe how cute presley and conner look together! 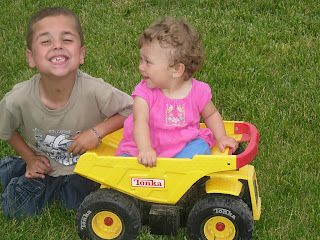 She looks like she is having fun in his dump truck! They look so cute!